Happy Valentine's Day. This is a nice holiday because it's providing a nice diversion from all the cold, ice and snow we're having. 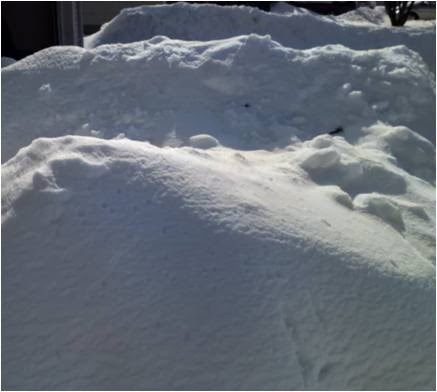 I got some shoveling in today so I can check the cross training box once again. I also ran on the treadmill this morning and can check the running while un-stimulated box. But I did give my feet a Valentine. A few weeks ago I bought two pairs of gel insoles for my shoes, so my feet wouldn't end up blistered and sore after a walking around NYC all day. They do a good job compared to regular insoles and I've felt much better after covering five or more miles on city streets. My Saucony Kinvaras have about 700 miles on them and they have served as my treadmill shoes for the last 200. 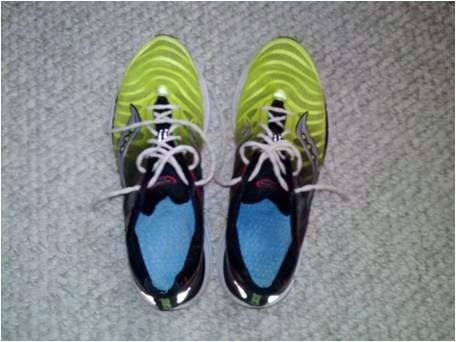 The Kinvara 3's have held up very well, but I think the mid-soles have lost a lot of their support. I decided to try the other pair of insoles for today's run and was pleasantly surprised with the results. I was concerned that the gels would be too mushy, but they turned out to be very supportive. My Kinvaras suddenly felt more like my old Adrenalins which provided a nice combination of cushioning and response. The biggest benefit came from lower fatigue in my calves and less strain underfoot. The tedium of the treadmill was somewhat mitigated by this additional comfort. Why hadn't I tried this before? Today's weather took a turn for the better and the temperatures finally rose above 32°, allowing some snow to melt. 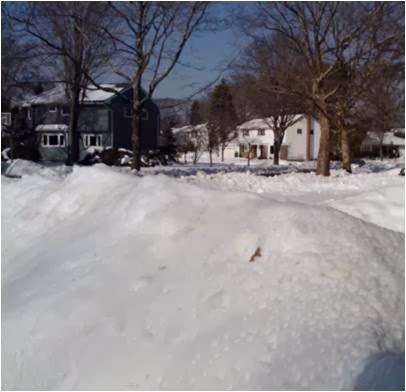 There's still plenty left and the snowbanks along my driveway remain about 4' high. I had hoped this would be enough to clear the roads for weekend running, but today's melt hardly made a dent. Temperatures have dropped again and we're expecting about three more inches tomorrow. So more treadmilling this weekend. At least my feet will be happy. I'm glad the insoles made a difference. It's nice to be able to get new life out a favorite pair of sneaks. I'll have to remember that before I buy my next pair of Ravennas - although I really want to try the new Transcends. With all the focus on minimalism, lighter shoes and less structure, I've stopped expecting much cushioning. I'd forgotten how much I'd missed it. It's always fun to buy new running shoes, but I might try a pair of gels in my Virratas before I go about replacing them. That's interesting that you still run in shoes with so many miles. I guess the insoles make all the difference. Those are some serious snow banks! It seems like the north shore gets more snow than the south shore. That's about the only advantage, I think. I was hoping to get a chocolate party recap or at least a detailed menu description. I think I posted before the party which was extremely chocolate focused. Besides the melted chocolate poured into molds, dipped bananas and mixed with nuts, there was a copious amount of Ghirardelli caramel-filled squares and nonpareils, York peppermint patties, Mars gift packs, samplers and assorted Hershey's and Dove pieces. plus lots of cards and non-edible presents. Lots of temptation but everyone kept within moderation! Um. Celia and I (like how I dragged her into this?) expect invitations for Chocopalooza 2015. Save the date! Chocolate first, then a run around the neighborhood to run off every calorie.